I have just returned from a short holiday to read 'The Economist' newspaper for August 1 to 7, 2015. 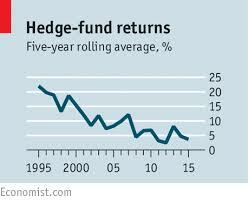 One of the leading articles is about public sector pension funds and hedge funds, which may be of interest to us (link below). The leader observes that in recent years hedge funds have not been doing any better than ETFs (straightforward investments that any individual can make). The article also observes that "Instead of aiming at the very wealthy, the hedge fund industry now targets institutions such as pension funds." The article adds that Calpers, the giant Californian public pension fund, "has concluded that putting money into hedge funds is not worth the bother." The Economist evidently shares that conclusion, commenting: "For the pension schemes that are the hedgies' latest target, handing over cash makes no sense." I can only imagine that our pension fund will be targeted in due course, if it has not already been targeted.